On the Soul (Greek Περὶ Ψυχῆς, Peri Psychēs; Latin De Anima) is a major treatise written by Aristotle c. 350 BC. Although its topic is the soul, it is not about spirituality but rather a work in what might best be described as biopsychology, a description of the subject of psychology within a biological framework. His discussion centres on the kinds of souls possessed by different kinds of living things, distinguished by their different operations. Thus plants have the capacity for nourishment and reproduction, the minimum that must be possessed by any kind of living organism. Lower animals have, in addition, the powers of sense-perception and self-motion (action). Humans have all these as well as intellect. 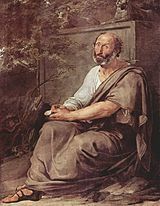 Aristotle holds that the soul (psyche, ψυχή) is the form, or essence of any living thing; it is not a distinct substance from the body that it is in. It is the possession of a soul (of a specific kind) that makes an organism an organism at all, and thus that the notion of a body without a soul, or of a soul in the wrong kind of body, is simply unintelligible. (He argues that some parts of the soul — the intellect — can exist without the body, but most cannot.) It is difficult to reconcile these points with the popular picture of a soul as a sort of spiritual substance "inhabiting" a body. Some commentators[who?] have suggested that Aristotle's term soul is better translated as life-force. In 1855, Charles Collier published a translation titled On the Vital Principle. George Henry Lewes, however, found this description also wanting. DA III.12–13 take up the question of what are the minimal constituents of having a soul and being alive. Book I contains a summary of Aristotle's method of investigation and a dialectical determination of the nature of the soul. He begins by conceding that attempting to define the soul is one of the most difficult questions in the world. But he proposes an ingenious method to tackle the question: just as we can come to know the properties and operations of something through scientific demonstration, i.e. a geometrical proof that a triangle has its interior angles equal to two right angles, since the principle of all scientific demonstration is the essence of the object, so too we can come to know the nature of a thing if we already know its properties and operations. It is like finding the middle term to a syllogism with a known conclusion. Therefore, we must seek out such operations of the soul to determine what kind of nature it has. From a consideration of the opinions of his predecessors, a soul, he concludes, will be that in virtue of which living things have life. Book II contains his scientific determination of the nature of the soul, an element of his biology. By dividing substance into its three meanings (matter, form, and what is composed of both), he shows that the soul must be the first actuality of a naturally organised body. This is its form or essence. It cannot be matter because the soul is that in virtue of which things have life, and matter is only being in potency. The rest of the book is divided into a determination of the nature of the nutritive and sensitive souls. (1) All species of living things, plant or animal, must be able to nourish themselves and reproduce others of the same kind. (2) All animals have, in addition to the nutritive power, sense-perception, and thus they all have at least the sense of touch, which he argues is presupposed by all other senses, and the ability to feel pleasure and pain, which is the simplest kind of perception. If they can feel pleasure and pain they also have desire. Some animals in addition have other senses (sight, hearing, taste), and some have more subtle versions of each (the ability to distinguish objects in a complex way, beyond mere pleasure and pain.) He discusses how these function. Some animals have in addition the powers of memory, imagination, and self-motion. 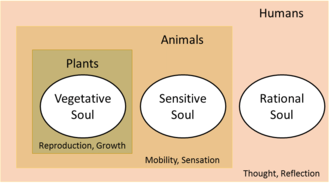 Aristotle describes the structure of the souls of plants, animals, and humans in Books II and III. Book III discusses the mind or rational soul, which belongs to humans alone. He argues that thinking is different from both sense-perception and imagination because the senses can never lie and imagination is a power to make something sensed appear again, while thinking can sometimes be false. And since the mind is able to think when it wishes, it must be divided into two faculties: one which contains all the mind's ideas which are able to be considered, and another which brings them into act, i.e. to be actually thinking about them. These are called the possible and agent intellect. The possible intellect is an "unscribed tablet" and the store-house of all concepts, i.e. universal ideas like "triangle", "tree", "man", "red", etc. When the mind wishes to think, the agent intellect recalls these ideas from the possible intellect and combines them to form thoughts. The agent intellect is also the faculty which abstracts the "whatness" or intelligibility of all sensed objects and stores them in the possible intellect. For example, when a student learns a proof for the Pythagorean theorem, his agent intellect abstracts the intelligibility of all the images his eye senses (and that are a result of the translation by imagination of sense perceptions into immaterial phantasmata), i.e. the triangles and squares in the diagrams, and stores the concepts that make up the proof in his possible intellect. When he wishes to recall the proof, say, for demonstration in class the next day, his agent intellect recalls the concepts and their relations from the possible intellect and formulates the statements that make up the arguments in the proof. The argument for the existence of the agent intellect in Chapter V perhaps due to its concision has been interpreted in a variety of ways. One standard scholastic interpretation is given in the Commentary on De anima begun by Thomas Aquinas when he was regent at the studium provinciale at Santa Sabina in Rome, the forerunner of the Pontifical University of Saint Thomas Aquinas, Angelicum. Aquinas' commentary is based on the new translation of the text from the Greek completed by Aquinas' Dominican associate at Viterbo William of Moerbeke in 1267. The argument, as interpreted by St Thomas Aquinas, runs something like this: in every nature which is sometimes in potency and act, it is necessary to posit an agent or cause within that genus that, just like art in relation to its suffering matter, brings the object into act. But the soul is sometimes in potency and act. Therefore, the soul must have this difference. In other words, since the mind can move from not understanding to understanding and from knowing to thinking, there must be something to cause the mind to go from knowing nothing to knowing something, and from knowing something but not thinking about it to actually thinking about it. Aristotle also argues that the mind (only the agent intellect) is immaterial, able to exist without the body, and immortal. His arguments are notoriously concise. This has caused much confusion over the centuries, causing a rivalry between different schools of interpretation, most notably, between the Arabian commentator Averroes and St Thomas Aquinas. One argument for its immaterial existence runs like this: if the mind were material, then it would have to possess a corresponding thinking-organ. And since all the senses have their corresponding sense-organs, thinking would then be like sensing. But sensing can never be false, and therefore thinking could never be false. And this is of course untrue. Therefore, Aristotle concludes, the mind is immaterial. Perhaps the most important but obscure argument in the whole book is Aristotle's demonstration of the immortality of the thinking part of the human soul, also in Chapter V. Taking a premise from his Physics, that as a thing acts, so it is, he argues that since the mind acts with no bodily organ, it exists without the body. And if it exists apart from matter, it therefore cannot be corrupted. And therefore the human mind is immortal. In Late Antiquity, Aristotelian texts became re-interpreted in terms of Neoplatonism. There is a paraphrase of De Anima which survives in the Arabic tradition which reflects such a Neoplatonic synthesis. The text was translated into Persian in the 13th century. It is likely based on a Greek original which is no longer extant, and which was further syncretised in the heterogeneous process of adoption into early Arabic literature. A later Arabic translation of De Anima into Arabic is due to Ishaq ibn Hunayn (d. 910). Ibn Zura (d. 1008) made a translation into Arabic from Syriac. The Arabic versions show a complicated history of mutual influence. Avicenna (d. 1037) wrote a commentary on De Anima, which was translated into Latin by Michael Scotus. Averroes (d. 1198) used two Arabic translations, mostly relying on the one by Ishaq ibn Hunayn, but occasionally quoting the older one as an alternative. Zerahiah ben Shealtiel Ḥen translated Aristotle's De anima from Arabic into Hebrew in 1284. Both Averroes and Zerahiah used the translation by Ibn Zura. ^ Mark Shiffman (2011). Aristotle's On the Soul. Focus Publishing. p. 3. ISBN 978-1-58510-491-8. ^ George Henry Lewes (1864). Aristotle: A Chapter from the History of Science, Including Analyses of Aristotle's Scientific Writings. OCLC 15174038. ^ In chapter 3 of Book II he enumerates five psychic powers: the nutritive (θρεπτικόν), the sensory (αἰσθητικόν), the appetitive (ὀρεκτικόν), the locomotive (κινητικὸν), and the power of thinking (διανοητικόν). ^ Rüdiger Arnzen (ed. ), Aristoteles' De anima, Volume 9 of Aristoteles Semitico-Latinus, 1998. Alfred L. Ivry, The Arabic Text of Aristotle's "De anima" and Its Translator, Oriens Vol. 36 (2001), pp. 59-77. On the reception of De Anima in Arabic tradition in general see Rafael Ramo Guerrero, La recepcion arabe del DE ANIMA de Aristoteles: Al Kindi y Al Farabi, Madrid (1992) for an overview of literature. Compare also the Arabic text known as Theologia Aristotelis, which is in fact a paraphrase of Plotinus Six Enneads. ^ Josep Puig Montada, Aristotle's On the Soul in the Arabic tradition, Stanford Encyclopedia of Philosophy, (2012). D.W. Hamlyn, Aristotle De Anima, Books II and III (with passages from Book I), translated with Introduction and Notes by D.W. Hamlyn, with a Report on Recent Work and a Revised Bibliography by Christopher Shields (Oxford: Clarendon Press, 1968). Walter Stanley Hett, On the Soul (Cambridge, Mass. : Harvard University Press "Loeb Classical Library", 1957). R. D. Hicks, Aristotle De Anima with Translation, Introduction, and Notes (Cambridge University Press, 1907). Edwin Wallace, Aristotle's Psychology in Greek and English, with Introduction and Notes by Edwin Wallace (Cambridge University Press, 1882). Rüdiger Arnzen, Aristoteles' De anima : eine verlorene spätantike Paraphrase in arabischer und persischer Überlieferung, Leiden, Brill, 1998 ISBN 90-04-10699-5. J. Barnes, M. Schofield, & R. Sorabji, Articles on Aristotle, vol. 4, 'Psychology and Aesthetics'. London, 1979. M. Durrant, Aristotle's De Anima in Focus. London, 1993. M. Nussbaum & A. O. Rorty, Essays on Aristotle's De Anima. Oxford, 1992. F. Nuyens, L'évolution de la psychologie d'Aristote. Louvain, 1973. This page was last edited on 11 December 2018, at 13:55 (UTC).